Fuel consumption in shipping and the associated costs are enormous - it is not without reason that many operators pursue a slow steaming strategy. But this is not a permanent solution. In the "Safety and Shipping Review 2015" Allianz Global Corporate & Specialty warns that this technology shortens the life of the engine and increases polluting emissions. So rather than restrictions, increased efficiency is more effective in reducing consumption and preventing permanent damage. One possibility for this is the "indicating" of the engine - the dynamic pressure measurement in the combustion chamber of the diesel engine at the indicator valves - the PREMET X measuring device presented by CM Technologies GmbH at this year's SMM in Hamburg, makes it possible to precisely determine the cylinder pressure at every cylinder position, the actual injection and ignition timing, as well as other aspects of the combustion process. Based on the results, the injection can be optimised and fuel consumption reduced. Furthermore, nearly all wear processes can be monitored and maintenance planned accordingly. Innovative sensors from Kistler Switzerland are used for maximum reliability, making it possible to measure pressures up to 350 bar. "The actual values of a diesel engine do rarely correspond to the setpoints, which translates into performance losses," explains Matthias Winkler, Managing Director of CM Technologies GmbH. "This manifests itself as increased need for fuel and thus increased operating costs. A poorly balanced engine often consumes up to two percent more fuel." That is why it makes sense from an economic point of view to regularly check the condition of an engine. Dynamic pressure measurement is particularly suitable for slow or medium-speed models. "Not only does the pressure curve reveal the specific timing of a diesel engine, it also shows if the desired performance is being provided. 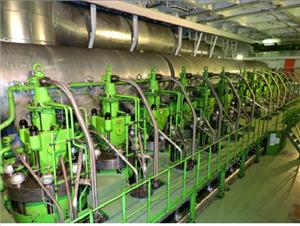 This in turn provides information about the efficiency of the engine. A reliable indicating device makes the complex process of measuring the power on the shaft superfluous," continues Winkler. Indicating even makes it possible to detect damage such as blow-by or worn injectors early. With the PREMET X indicator device, which is now available in the third generation, adjustments on the diesel engine can be made while measuring. CM Technologies GmbH, which acquired the PREMET production and brand rights at the end of 2016, has integrated numerous new features. "The new PREMET X has an innovative PiezoSmart pressure sensor that dynamically records the pressure curve over time in the cylinder of an internal combustion engine," explains Winkler. The measurement can be carried out in a few simple steps. First, briefly open the indicator valve on the cylinder head during operation to blow out any blockages. Then the sensor must be placed on the indicator valve and the indicator valve must be re-opened. The measurement starts automatically and ends according to the presetting after 1 - 20 cycles. No input is required on the measuring device - it only serves as a display unit during the measurement. Finally, the valve is closed again and the sensor is removed. Then, thanks to the automatic measurement mode, other cylinders can be measured without any interruption. In all, the internal memory can save the values from up to 20 motors with 20 cylinders each. The user-friendly touch display allows all measurement results to be read directly from the device and compared with setpoints. This means that, among other things, changes to the engine settings and their effect can be checked without time delay. The new version of the PREMET X has been comprehensively upgraded by CM Technologies and equipped with additional features. "As a central extension, we decided to use smart sensors, making it easier for the sensors to exchange data. All the calibration and sensor data is stored electronically within the sensor and can be read using the device," explains Winkler. Another innovation is the ability to store data in both local and global clouds, allowing the results to be accessed from any PC in the world. The data can be automatically uploaded to the cloud either by email or via any W-LAN network in the nearest port, using a mobile phone for instance. Included in the delivery is basic software to evaluate and support uploading to the cloud. "It can be used to calculate trends and mean values, as well as display all results as bar charts, graphs or tables," notes Winkler. "Developments can also be illustrated using a p-α diagram or a p-V diagram." The software is available in both a single-user as well as an office version with multiple accounts for comparisons between different ships. Furthermore, the device supports various cloud services. In addition to a cloud solution developed by CMT, there is also a connection for the DNV / GL ECO Insight. This makes it possible to compare the performance data of different ships in a fleet without detours, so that weak points can be found faster. In addition to the pressure sensor, the PREMET X can also be expanded with other sensors. This includes a simple TDC sensor for the XL version that, with the TDC, provides another orientation point to determine the crankshaft angle. The XLMS version also includes a sensor that detects the exact angle of the crankshaft. "This is particularly useful in the context of fuel savings. If the combustion is just 1° late, consumption increases by about two percent," argues Winkler. Optional for all versions is an acoustic emission sensor, which makes it possible to also monitor the injection process and the valve control. CM Technologies has equipped the device with a shock-absorbing cover to prevent damage caused by falls, especially considering the harsh environment on board. In the unlikely event of a failure or if the device needs to be calibrated, the company offers comprehensive calibration and repair services. "Of course, if required, we also support our customers with data analysis and optional evaluation service," concludes Winkler.